Ah, how I’ve missed thee Umami Mart. This year has been über-hectic and I’ve taken a little hiatus from my food writing this summer what with things getting on top of each other and a bad upper back. A combination of acupuncture, salonpas and time seems to have given me a reprieve for the moment. However, in the meantime, Kayoko and Yoko have transformed Umami Mart into a brick and mortar store. It’s an amazing achievement and I am dying to visit! But things are settling down and my stomach is grumbling. Check out a hidden little French gem in the heart of Bloomsbury at Umami Mart: Slightly Peckish! I didn’t really want to share this but I love you all so much. How could I not? In bookish news, Mo Yan has won the Nobel Prize in Literature this year and is the first Chinese writer to do so. Have any of you read his work? Hilary Mantel has wowed the Booker judges again and strode off with this year’s prize. How wonderful. I loved Wolf Hall for its exciting storytelling and immediacy and can’t wait to read this one. I’m also reading Madeline Miller’s The Song of Achilles, this year’s Orange Prize winner and although I’m not even halfway, I’m totally in love with it. It’s beautifully written and not what I expected at all. I didn’t think I could be so captivated by the classics (even though I do love the classics, it does have a rather dry image). Caroline and Lizzie are hosting German Literature Month II next month if you fancy reading some translated fiction. And Bellezza is doing a readalong of Haruki Murakami’s Norwegian Wood in November if you’d like to join her too. And I’ll leave you with an article on Murakami in The New Yorker. Just because. Do also check out Badaude’s contribution to the Whipple Museum‘s first art book, The Rules of Form: Sonnets and Slide Rules. 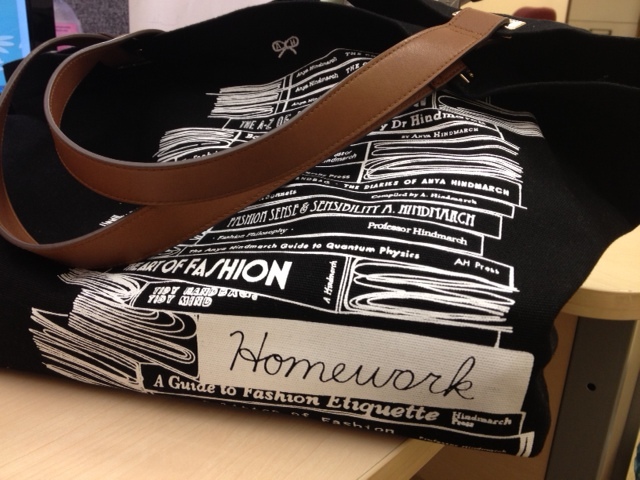 And the picture is of my homework tote by Anya Hindmarch. Don’t you just love bags that have book on it (as well as inside it)? Thanks for mentioning our event. I’m glad you are joining us and looking forward to your choices. Pleasure! Looking foward to seeing what everyone will be reading. Amazing bag! And thanks for the Murakami article. I’ve just finished reading 1Q84 today and have to admit to sharing the disappointment that he didn’t win the Nobel. Isn’t it? And yes, I’m gutted too. Maybe next year? Looking forward to your posts, Stu! Hey! Salonpas ❤ The smell is so natsukashii. Obviously I have been slow on the food posting front too but planning to rectify; gonna get back on the horse next week! Off to check out some reading recommendations – I have so much novel reading lust after all this research..
Hello Sasa chan! Looking forward to catching up on your posts!